This week ranged from very cool weather to pleasant temperatures along with a day of very heavy rain and high winds. At least that lasted only 1 day and the rest of the week was good weather along with good fishing. absolute MONSTER measuring every bit of 48" and had a massive girth. 3rd day brought very fast action and had them catching over 75 Northern Pike. 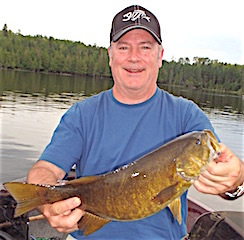 That evening Al & Dave tore up Smallmouth Bass on surface baits including 3 Trophy fish 18-19-inches. 4th & final day they had good fishing but it was very hard to top their 1st three days. All left having had fabulous fishing & loads of fun among family & friends with their last words being, "We Will Be Back". the weeds or on weed lines. The summer transition has happened. 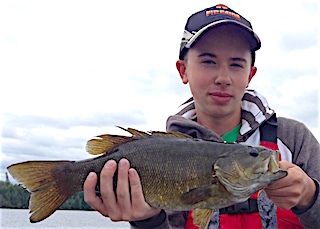 5th day was great catching many Northern Pike & Dennis got into some Big Smallmouth Bass Fly-Fishing a popper. All left thoroughly enjoying their stay. 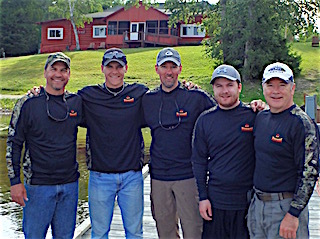 Returning Guest David Montovani, Indianapolis, IN brought 1st time Guests Bill & Walker Radez, & Joey Droter, from Carmel, IN, Bloomfield, CO & Chicago, IL for their 1st experience Fishing at Fireside Lodge. 1st day they tore it up catching 80 Northern Pike plus Bill caught a 17.5 and a Trophy 19" Smallmouth Bass. 2nd day was slower catching some fish but they were spoiled from their 1st days results. 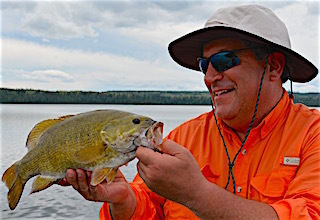 3rd day was good with Bill having the best day on both Northern Pike & Smallmouth Bass. 4th & final half day was good weather & good fishing. All left expressing what a great time was had by all. Long time guests father & Son Wayne & Todd Busdiecker from Centerville & Waynesville, OH returned for their 9th time ready to fish. DOA they got right to it catching 16 Northern Pike & a Smallmouth Bass. 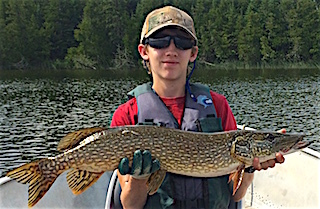 1st day was terrific Northern Pike fishing as they caught 50-60 Northern Pike. 2nd day was also a very good day catching a bunch of Pike 28-35" plus Todd landed a beauty 38” Muskie. 3rd & final day the Northern Pike just kept coming catching another 40-45 fish making it a great finish and they hope to see us again next year. The Spahr family Father / Grandfather Phil, Sons Tim & Brad & Grandsons Stephen & Christopher from Fairborn, OH & Marborogh, MA returned for their 18th consecutive year. 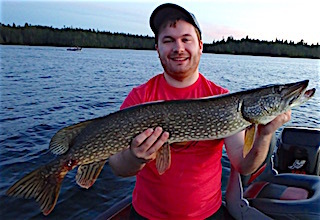 Fish were caught right on the DOA & 1st day started with Stephen catching a BIG 33" Pike & Phil landing a 35"
Muskie. Tim also had a Muskie on until it jumped & threw his lure & they caught 28 Northern Pike 10 SB plus had 6 Muskie hooked landing 3 nice fish, Phil catching his 2nd. 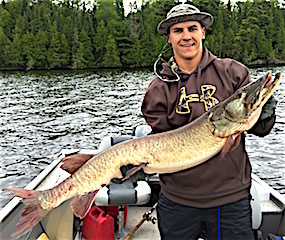 2nd day Phil did it again landing 2 more Muskie on a Mepps & his favorite Beatle Spin. 3rd day was unreal as they caught 81 Northern Pike & 6 Smallmouth Bass before suppertime. 4th day was a complete wash having heavy rain all day with strong winds but they worked on an old fashion puzzle keeping them busy all day. 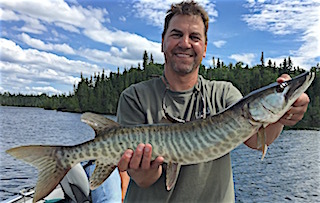 Brad did manage to get out with Tim losing a big tiger Muskie & catching a 34-incher. 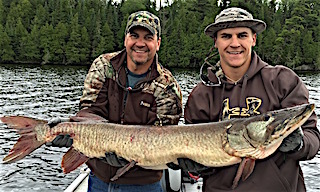 5th & 6th days were more focused on Muskie with both Stephen & Christopher catching one plus Brad had a big 36-inch Northern Pike. All left having a wonderful family fishing vacation making priceless memories together. Consecutive year guests for 17 years, Ron & Lisa Vincent from Sherrills Ford, NC were thrilled to be back. DOA & 1st day these two caught over 60 Northern Pike, 3 Smallmouth 17.75-18.5-inches plus Ron lost a 40-inch plus Northern Pike. 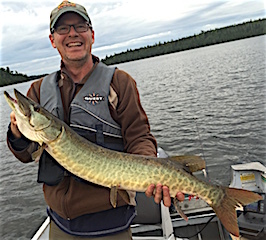 2nd day they caught LOTS of Pike & Smallmouth & both caught a Muskie; Lisa with a Tiger & Ron caught a 36-inch Spotted Muskie. 3rd day they caught 27 Pike 6 Smallmouth Bass 17-18-inches plus each caught a Tiger Muskie 30–35-inches. 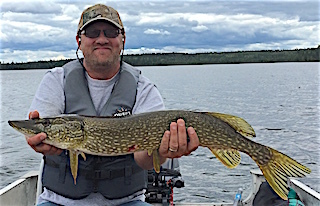 4th day despite being a stormy rainy day they caught 15 Northern Pike & had a Moose sighting on the lake. 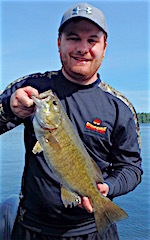 5th day they were on fire catching over 75 Northern Pike plus caught 3 Trophy Smallmouth between 18-18.5-inches. 6th day was a day off for Lisa & Ron alone caught 26 Pike a 19.5-inch Trophy Smallmouth & had 2 huge Muskie follows. 7th & final day they caught 25 Pike, 15 SB plus Ron, while fighting a Smallmouth Bass, a BIG Muskie came up ate his Bass and got hooked. The fight was on but with Ron only having 6lb test & no leader the odds were with the Muskie, which ended up breaking off during a netting attempt. Both left having another wonderful trip & hope to return in 2017. Brothers Johnny & Leo Cauzo plus Leo’s son Gianluca from Pointe Claire & Montreal, Quebec returned for their 2nd time. 1st day they had fun catching 20 Northern Pike. 2nd day was another good day Pike fishing catching 32 total. 3rd & final day was fabulous catching a mix of Northern Pike & Smallmouth Bass, and had shore lunch by Twin Falls. All had great family fishing making memories to last a lifetime. Ted Payseur & Jan Anderson from West Des Moines, IA were here for there 2nd year in a row bringing with them 1st year fishers, John Sr and John Nelson, & Allen Scheef from Racine, WI. 1st day this group had great Northern Pike fishing with Ted & Jan catching 45-50 & John Sr, John & Al saying they caught about the same. 2nd day was slower still catching some fish. 3rd was a rainy windy day but all had good success, mostly on Pike, & at suppertime Jan & Ted were searching out my tackle shop to find the lure that was working. 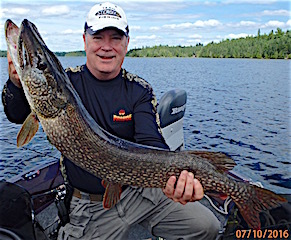 John Sr, John, Al had a very good day also catching a lot of Northern Pike 28 to 35". 4th was another good day Pike fishing. 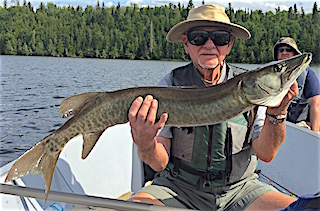 5th they finished strong catching many toothy critters Ted catching a very heavy 36-inch Tiger Muskie, John with a 37-inch Northern Pike & Al had a 39-inch just missing the Mater Anglers Award for the Northern Pike category. All left having w wonderful stay & before departing Jan & Ted discussed dates for 2017. The Gillam Family Bill, Claudia, Blair, & Charlotte from Elwood, IN & Chantilly, VA. Returned for their 3rd time. 1st day all caught some fish and enjoyed the wilderness fishing we have at Fireside Lodge. 2nd day was almost a complete wash out with heavy rain & wind but they really caught up on their sleep. 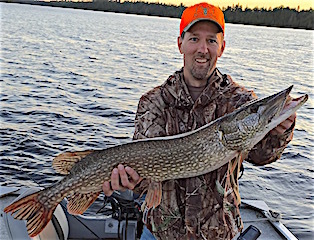 3rd day the skies cleared & sunshine was welcome bringing a change in the fishing as they had some good action with Blair catching his biggest Northern Pike. Charlotte also had an accomplishment finishing the book she was reading. Audrey always says fishing means different things to different people. After Blair & Charlotte departed Bill & Claudia stayed one more day enjoying some great weather while catching Northern Pike. 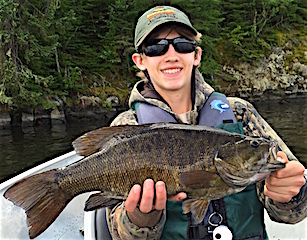 They also experienced a very large, over 40-inch, fish follow their boat for over 20 minutes staying very near the boat and at times was so close to the surface it’s fins would come above the waters surface. This made a great finish to a wonderful family trip. Returning were 16 year guests Al Sins, Asheville, NC Dave & Pam Hamilton, Raleigh, NC & Charlie Dotson also form Ashville for his 1st experience. 1st day all caught fish and had some Muskie follows. 2nd day the weather prevented them from fishing much as we had 1.13 inches of rain with high winds. 3rd day was great fishing with each person catching over 20 Northern Pike plus Dave caught a Trophy Smallmouth Bass. 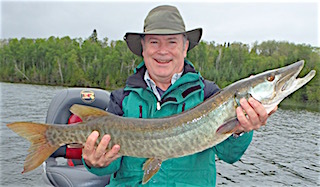 4th day Al & Charlie caught some 30” Northern pike & had 10 Muskie follows but no takers. The biggest catching was had by Mr Eagle as all saw a Bald Eagle swoop down to grab a fish, but the fish was too big to go air born with it so the eagle swam with the fish in it's talons & dragged it up on shore. What an amazing sight to see. 5th day Al & Charlie caught some nice Pike, had Muskie follows and Al caught 2 Muskie while Dave & Pam also caught some nice Pike but saw, as quoted by Dave, "The Chamber of Commerce Fish" which was a HUGE Muskie. 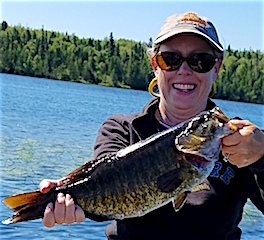 Pam also caught a Master Anglers Award Smallmouth Bass. Dave Echert from Haubstadt, IN returned for his 2nd year in a row with his wife Lois & brother-in-law Steve Weber. 1st day was great as they caught over 25 Northern Pike up to 31-inches. 2nd day the action was great hooking 50+ Northern Pike landing close to 30. 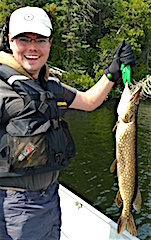 3rd day was windy with heavy rain & a little tougher catching 15+ Northern Pike Steve landing a few in the mid 30" range. 4th day they had good Northern Pike fishing. 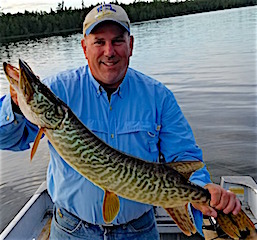 Deciding to stay an extra day paid off as they caught a lot of bigger Northern Pike & Smallmouth Bass with Dave landing a 19.5-inch Smallmouth & a 39" Northern Pike. After catching 2 fish on 2 casts Steve was about to throw Dave in the water had he caught a 3rd consecutive fish. All left have a great time & hope to return. 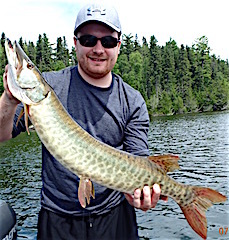 Catches of The Week: Muskie 48", 38" Tiger Muskie, 2-39" Northern Pike, Smallmouth Bass 1-19.5", 2-19.5", 6-18.5", 5-18"